The NFL draft is less than three weeks away, and teams are in a fervor trying to adjust draft boards and uncover every little piece of information they can about each prospect. A lot can and will happen between now and April 28th, and there are still plenty of teams near the top that could go in a number of different directions on draft day. As draft day nears, teams are forced to tip their hands at least a little — by bringing in specific players for private workouts and attending certain pro days with more enthusiasm than others, clubs’ needs and targets are becoming more public. Of course, that’s in direct conflict with the amount of bad information and smokescreens most teams are putting out to mask which prospects they truly value. Pro Football Rumors’ first mock draft of 2016, which can be found below, starts with a pair of picks that aren’t outside the realm of possibility, but certainly aren’t the consensus selections for the Titans and Browns. Unlike in some past seasons, those top two selections aren’t set in stone yet, and the direction taken by Tennessee and Cleveland will have a significant impact on the rest of the board, as this mock shows. For now, here is – to the best of my abilities – a breakdown of which players teams might be targeting in the first round at the end of April, even if these clubs ultimately take an approach much closer to chalk on draft day…. Laremy Tunsil is still the leading candidate for this pick, based on the idea that left tackle Taylor Lewan could move to the right side, where he could produce more consistently and effectively. However, I see Lewan as an ascending player, one whom Pro Football Focus ranked as the 12th-best offensive tackle in the NFL in 2015. The Titans seem to be considering Ramsey, and it shouldn’t be a surprise if they target him with the first pick. If Ramsey is a slight curveball at the top of the draft, that probably makes Jack at No. 2 a gyroball. The signing of Robert Griffin III doesn’t solve the Browns’ problems at quarterback, but it would be difficult to justify having RGIII split reps with a high pick and failing to commit to developing either player. 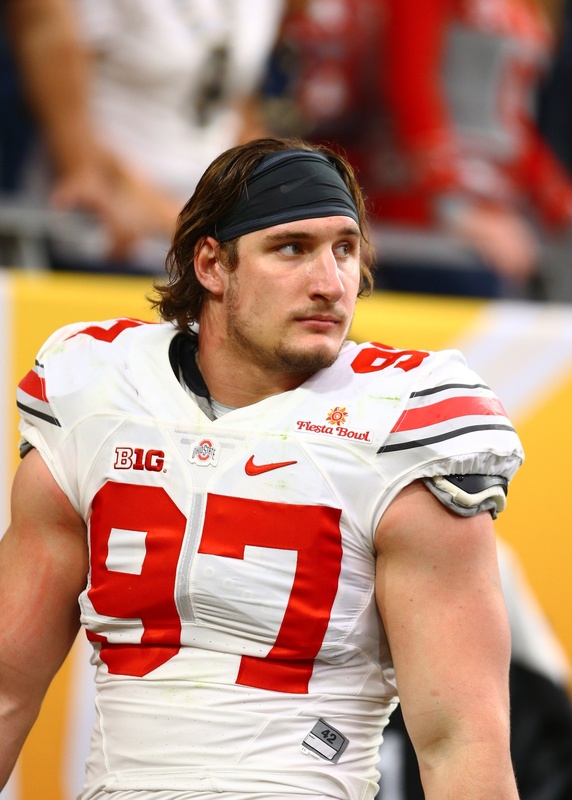 Joey Bosa isn’t a perfect fit in a 3-4 and Tunsil doesn’t fit a pressing need unless he will be destined to the right side for the rest of Joe Thomas‘ tenure in Cleveland. But Jack could be the outstanding athlete that the Browns look at as the cornerstone of a rebuilding defense. The team could still draft a quarterback in a later round. The craziness stops, as the Chargers take the best player available and fill a huge need on their crumbling offensive line. Tunsil has been compared to Tyron Smith, with his elite athleticism giving him the chance to anchor the line in San Diego. DeForest Buckner would be another great fit, who could step in and immediately become an impact player as a 3-4 defensive end. The Chargers could be a dark horse for a quarterback as well — every reason pundits believe the Cowboys need to draft a QB applies even more strongly to the Chargers, who should be in rebuilding mode with a possible move to Los Angeles looming. The Cowboys will have a tough time passing on the best player available, even with their choice of quarterbacks still on the board. While I would applaud the Chargers for thinking ahead, the Cowboys have a window open right now to win a Super Bowl and they’d better be in love with a passer in order to pass up an impact player on defense. Bosa could replace Greg Hardy and eventually form an unbelievable tandem with Randy Gregory, if last year’s second-round pick can manage to work through his off-the-field issues. Ezekiel Elliott is also interesting here, but with Darren McFadden returning and Alfred Morris now in the mix behind a standout offensive line, running back isn’t a huge issue that needs to be immediately resolved with a high pick. The board breaks badly for the Jaguars in this scenario. Jacksonville will hope at least one quarterback is selected in the top four, with an eye toward landing one of the four players drafted ahead of them. DeForest Buckner might be the best player available, but the Jags’ tremendous need at corner could push them to consider Hargreaves if Ramsey and Jack are already off the board. 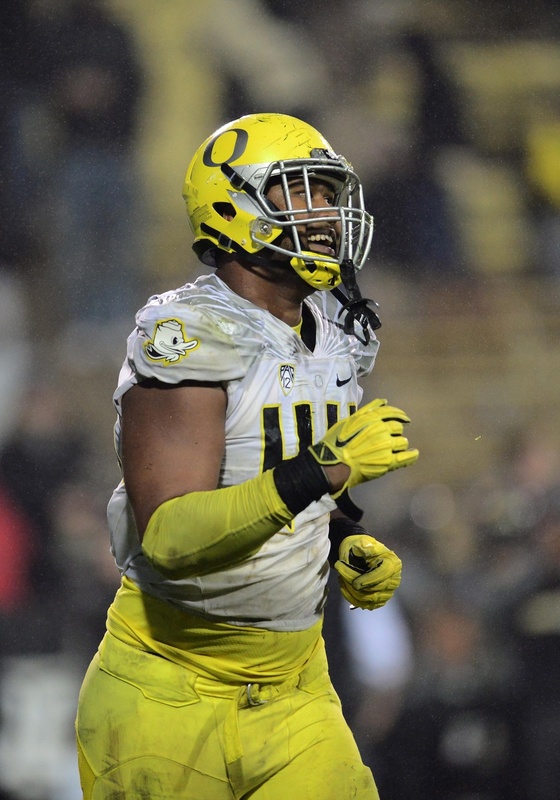 DeForest Buckner continues to be a great option, but Stanley could become the future at left tackle in Baltimore. He isn’t the prospect that Jonathan Ogden was, but getting by with Bryant McKinnie, Eugene Monroe, and moving star guards over to left tackle can’t be the long-term plan for success. Owner Steve Bisciotti wants to add corners and pass rushers to the struggling defense, but the board dictates those will have to wait for the later rounds. Colin Kaepernick is still in the fold (for now) but the 49ers need to consider quarterback very strongly, and while local kid Jared Goff is a safer pick, Wentz may be the more likely selection, given the traits Chip Kelly values. The 49ers have considered trading up, which points to Wentz as the preference. By all accounts, he is a smart player who makes quick decisions and throws with great accuracy, while also providing some value as a runner with very good athleticism. It doesn’t hurt that Kelly has a history of taking chances and outside-the-box thinking, so the fact that Wentz isn’t a Division I-A athlete shouldn’t be a major deterrent. The Eagles’ apparent interest in quarterbacks might be a smokescreen, but sitting with the eighth pick and having Goff drop to them makes it hard to ignore. Sam Bradford‘s contract – while pricey in the short-term – is only guaranteed for $4MM in 2017, and though Chase Daniel is familiar with Doug Pederson’s offense, he’s far from a surefire starter. Goff would make it a crowded quarterback competition, but his talent is tantalizing enough to warrant this selection. The Buccaneers haven’t been associated with a lot of the big names in the draft, but Buckner is too good to fall any farther than this. He isn’t the pass rusher they need, but could help bolster the defensive line next to Gerald McCoy. If Buckner is off the board, Shaq Lawson would make sense for the Bucs, and if there was demand for Buckner at this spot, they could consider trading back a few spots in this scenario. The offseason was about defense, as the Giants revamped their D-line and secondary. They were probably hoping Stanley would fall to them, with the thinking that they could move Ereck Flowers to the right side. However, a pair of skill position players could be at the top of their wishlist. Laquon Treadwell ran poorly at his pro day, but his size and strength might make him the perfect complement to Odell Beckham Jr.. Still, running back is the bigger need and Elliott is the better player, so he slots in here as Eli Manning‘s new buddy in the backfield. When general manager Ryan Pace says he likes the quarterback class, he probably means he sees value in the later rounds. However, the team seems to be moving away from Jay Cutler, or at least looking ahead to the future, and it may benefit Lynch to learn for a year as a developmental passer. The Bears have also been rumored to be interested in Muhammad Wilkerson, and this pick would certainly be enough to get the Jets to consider moving their franchised star. The Saints are another team that hasn’t been associated with a lot of high-ranking prospects with any consistency, and they could go in a number of directions with this pick. Cornerback would be an option, but the front seven needs an upgrade and a number of players fit the bill. Shaq Lawson would give New Orleans the second pass rusher the team desperately needs, but Lee is an athletic marvel at linebacker. The former quarterback and safety from Ohio State can do it all from outside linebacker, and could cover up a lot of weaknesses as a three-down linebacker. Cornerback and running back are the biggest needs in Miami, and the Dolphins’ roster is in such bad shape that they are forced to draft for need more than they would like to admit. With the top running back off the board and no other runner carrying value at this slot, Alexander is generally considered to be in discussion as the third cornerback in this class. The Dolphins did host William Jackson III, and some draftniks consider him a rising prospect in this class as well, even if he is more likely to be selected in the back half of this round. The Raiders have been doing their due diligence on defensive linemen in this draft, meeting with potential first-day selections such as Jonathan Bullard and Vernon Butler. However, after a great free agent period that left them in the position to take the best player available, the Raiders might have the right opportunity to take a chance on Nkemdiche despite the baggage he brings. These aren’t the old Raiders who were a hotbed for troubled players under Al Davis, but the signing of Aldon Smith shows the club still isn’t afraid of taking a chance on a risky player if the talent is there. Nkemdiche would have been in the discussion as high as No. 1 if not for character questions, but he could drop even more precipitously if he falls past Oakland. Treadwell has a chance to tumble down boards after a slow 40-yard dash, but with the top three cornerbacks already off the board, his size makes him valuable to a Rams offense with questions at quarterback. 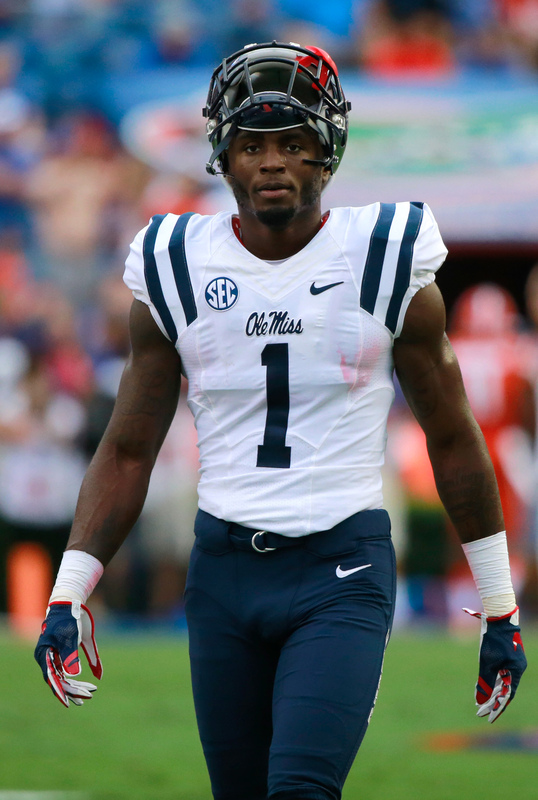 Some teams will have taken Treadwell off their boards, preferring other receivers, but the Rams have smaller contributors and the size and strength of the big Ole Miss wideout – along with his production – make him a strong candidate to be the first receiver taken. The Lions have been looking for defensive line help, but the surprising fall of Lawson should have them running to the podium. Detroit expressed interest in him, but having one of the best 4-3 defensive ends in this class fall to No. 16 certainly wasn’t a sure thing. Lawson will provide pass rush and run support on the edge, and will be a great bookend along with budding star Ezekiel Ansah as the Lions rebuild on the line. Ragland isn’t as flashy as Jack or Lee (or Jaylon Smith before the injury), but he is the prototypical linebacker on the inside. At Alabama he was the leader of the defense in the middle – a role the Falcons would likely allow him to take over – but he also provided value as a pass rusher both on blitzes and by putting his hand in the dirt on passing downs. Although some observers worry he’s only a two-down player, Ragland actually has good instincts in coverage and probably will only have to be replaced by a defensive back in the most obvious four-wide sets on third and long. The Colts need a lot more help than even they might realize, especially with a huge Andrew Luck extension looming, but pass rusher and pass protection are the two needs squarely at the top of their list. Spence has the most upside of any pure pass rusher in this draft, with the versatility to play 4-3 defensive end or 3-4 outside linebacker. The Colts have expressed interest in Spence, who was productive in the Big 10 for Ohio State before transferring to Eastern Kentucky, where he continued to produce. Rex Ryan and his staff have taken an interest in the group of prospects from Ohio State, which isn’t surprising considering the depth of talent among them, including a number of potential first-rounders. Eli Apple and Vonn Bell would be contributors in the secondary, and the Bills might be hoping either Lee or Elliot tumbles to them, but Decker makes a lot of sense for a team that needs to hit this pick after a quiet free agency. Cordy Glenn‘s future is uncertain even if he signed his franchise tag, but Decker would fit in at right tackle, with potential to play guard if he’s needed there. The Jets could consider adding to the defensive line again with the Muhammad Wilkerson situation looking less likely to resolve itself, and a player like Jonathan Bullard would complement the aggressive nature of Sheldon Richardson and Leonard Williams. Grabbing Henry might be a reach, but tight end represents by far the most glaring hole on the team (other than quarterback), and unless Gang Green trusts Jace Amaro to rise to another level, the club needs to address the position. Before making this selection, the Jets would likely explore moving back a few picks. Even head coach Jay Gruden knows Washington’s depth chart at safety is pretty scary, but the team’s unwillingness to bring in a player like Donte Whitner, as well as its resistance to re-signing Dashon Goldson, leaves Gruden’s club with the ability to add to the position. Enter Karl Joseph, who might be the best safety in the draft. Keanu Neal, Vonn Bell, and Darian Thompson have their respective backers, but if Joseph had been healthy all season, his tape may have separated him from the pack. Washington is also likely to consider Michael Thomas of Ohio State, who is reportedly the top receiver on its board. Unfortunately for Michael Thomas, the draft boards at receiver are all over the place this year, with six different players probably ranked as the No. 1 wideout in at least one team’s draft room. The Texans are in need of a speed receiver, and have long been intrigued by Miller, who has only spent one year at the position but has a long history of success with the ball in his hands. Most teams would be happy to see Houston reach for Miller, and common sense says even if the Texans target him, they’ll have the sense to move back or wait until round two. Still, there’s at least a chance they take a shot at pairing Miller with DeAndre Hopkins in round one. There is a run on receivers here – one that could have started one spot earlier if Washington had nabbed Thomas – which is partly due to the needs of these teams, but also due to the value of receivers in this class. The Vikings have been particularly interested in Doctson and wideouts in general, and are specifically looking for a big receiver for Teddy Bridgewater. Mike Zimmer has said the team isn’t looking to add a veteran, and that sentiment makes it even more likely the Vikes select one early in the draft. The Bengals are probably excited to see Coleman left standing at the end of this run. After losing Mohamed Sanu and Marvin Jones in free agency, they are in need of a complement to A.J. Green on the outside. They have also exhibited interest in Miller and Treadwell, among other receivers. The Bengals have signed Brandon LaFell and recently worked out Mike Williams and Hakeem Nicks, but that shouldn’t take receiver off their radar if the guy they like is there. The Steelers’ defense is falling behind the offense, and the organization will certainly look to bolster that side of the ball in the draft. Pittsburgh could also target a receiver after the Martavis Bryant suspension, but the team is more likely to go after a pass rusher like Kamalei Correa or add to the secondary. Jackson is a player in whom the Steelers have shown a lot of interest, and many teams would consider either he or Eli Apple to be the top corner on the board at this point in the draft. Common sense would dictate the Seahawks target the offensive line, and with Jack Conklin still on the board it would make a lot of sense for Seattle to jump on him. However, the team hasn’t valued those positions highly in recent years, and the Seahawks’ defensive mentality could bring them to the D-line. Bullard seems to be working out for every team in the back half of the round, but his discipline, strength, and versatility make him an ideal candidate to serve as an impact player across the front four in Seattle. 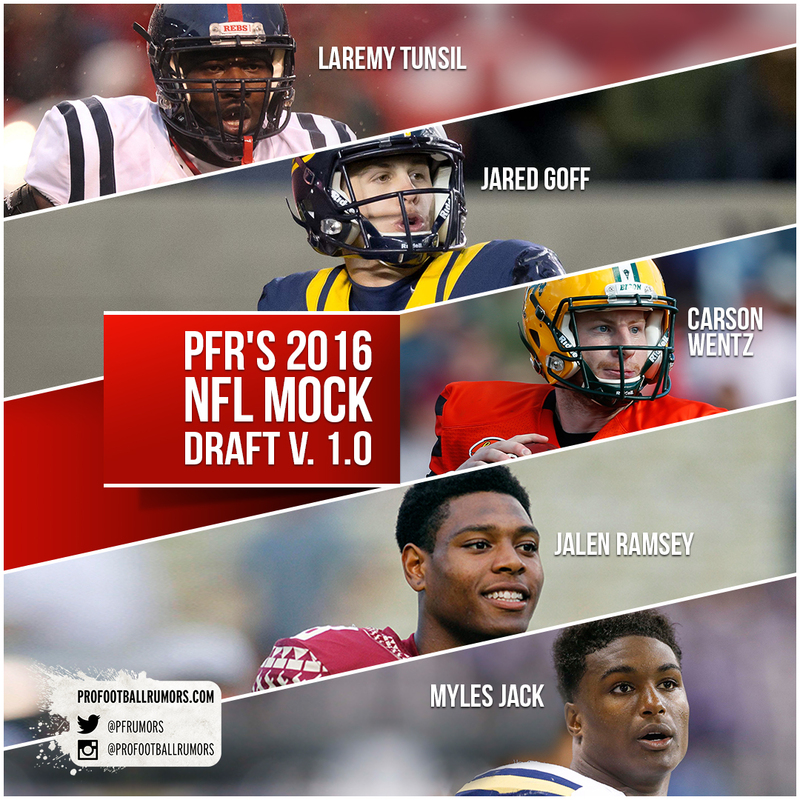 No team has played this draft closer to the vest than the Packers. Perhaps to the chagrin of Mike McCarthy, general manager Ted Thompson will almost definitely stay true to his board and take the best player available. That player will likely be the top defensive tackle available – Andrew Billings, Jarran Reed, or A’Shawn Robinson, presumably – or Conklin. If there’s a tie to be broken, it will go to helping out Aaron Rodgers, who is coming off a somewhat rough season by his standards. Conklin has the ability to play right tackle with left tackle potential, but also could be an impact player at guard. The Chiefs aren’t in huge trouble at pass rusher with Tamba Hali back in the fold and Dee Ford ready for increased role, but the depth behind them is bleak, given the uncertainty surrounding Justin Houston‘s injury. Adding Correa will give Kansas City a versatile player who can rush from multiple spots on the field. Correa is comfortable playing off the edge on the line or at linebacker, but also showed the ability to play inside linebacker at times in Boise State. That versatility means he’ll have ample opportunities to get on the field, and can provide a backup plan at multiple positions. The Cardinals will be in the market for a quarterback, and pass rusher is still a consideration even if trading for Chandler Jones mitigates that need, but they have a chance to go after the best player available. If Arizona doesn’t want to pull the trigger on a defensive tackle, Apple sits there as an obvious fit across from Patrick Peterson. Apple is a very big and very athletic corner, and his presence would allow Tyrann Mathieu to return to his joker role in the defensive backfield when the Honey Badger comes back from injury. There are a ton of options available here for the Panthers, who could use upgrades at cornerback, offensive line, and receiver. However, best player available could bring the team to defensive tackle, even with Kawann Short and Star Lotulelei manning those positions. The Panthers would have a plethora of options, and have shown interest in the big man Butler, who could immediately command the middle and eventually replace one of those two veterans. Quarterback is far and away the Broncos’ biggest need, but they probably would have hoped Paxton Lynch fell to them at No. 31 here. Grabbing Connor Cook, Christian Hackenberg, or Cardale Jones would be a reach at this spot. Dak Prescott might have been a better fit, but his recent DUI will likely push him into the third or fourth round. At No. 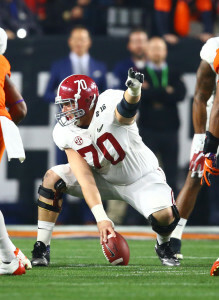 31, bolstering the offensive line should be a priority for Denver, and Kelly is a great fit who can play at center and take control of the line. Without a first-round pick due to Deflategate, the Patriots have to sit out of this mock draft. Still, by trading Chandler Jones and acquiring an extra second-round pick – giving them back-to-back picks at the end of round two – the Pats have the ability to make an impact through the draft. Offensive line and wide receiver are big areas of need, and so is pass rusher now that Jones is gone. To ensure they aren’t left out completely, here are two possible options that could still be on the board when the Patriots come to the podium late in round two. Even after adding Jonathan Cooper, the Patriots still need to revamp an offensive line that crumbled as the season went on in 2015. However, Bill Belichick knows that reaching for an offensive lineman at the end of round two isn’t going to solve any short-term problems, and sticking to their board is better for the long-term health of the team. 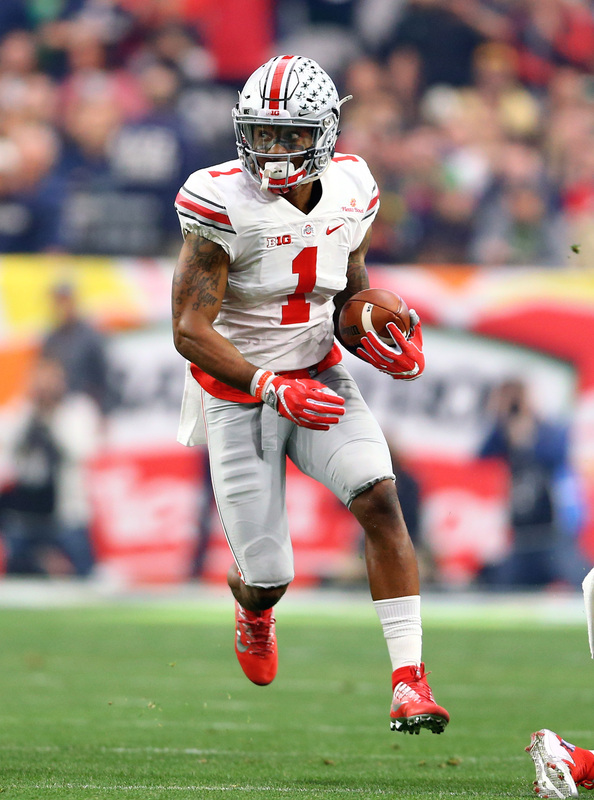 The Patriots love defensive backs in the second round, despite struggling to hit on those picks — they’d be thrilled to get one of Urban Meyer’s players here. Bell could fall as other safeties continue to rise up boards, and he would complement Devin McCourty very well. Belichick loved Meyer’s players when he was at Florida, but also had a penchant for drafting prospects out of Rutgers. The connection isn’t as strong now that Greg Schiano’s players have come and gone, but Carroo just seems like a perfect Patriot. He excels with his polished route running and sure hands, and could find himself on the field as a rookie on the outside. Even if Carroo doesn’t produce a big rookie season, New England often uses that position more to provide a threat and open up things underneath for their slot guys Still, Carroo is reliable enough to earn Tom Brady‘s trust quicker than most rookies. This is one of the worst mock drafts that I have seen so far. Way to many reaches… And a few players who will not go in the first round for sure. I could see some of the werid ones they have in the first 7 picks maybe happening but after that its way to crazy. I definitely tried to go a different way early in order to see how it would change the rest of the draft. There are easily two are three reaches that I wouldn’t expect to happen, but they are all players teams have expressed sincere interest in (e.g. Braxton Miller to the Texans/Hunter Henry tonthe Jets). I don’t expect either team to pull the trigger at that spot in round one, but I think the interest is sincere. Rob this is the first time ive seen a writer respond to comments in his article and I respect you for that. I was probably harsh with my tone in my comment but like I said I just think there are two many reaches. I understand that you tried to go a different route though. On the topic of browns taking wentz at number two like you were talking about in someone elses comment I feel stronglt the browns are going to trade down a few spots this year. I think they will give rg3 a shot this year and see what he does before putting to much pressure on him by drafting a rookie qb at number 2. They should drafr a qb this year I just dont know if they will do it at 2 with the signing of rg3. I happen to be in the “RG3 got screwed in Washington” camp, even if I will admit he brought a lot of it on himself. Still, he was sensational as a rookie and I valued him so high as a prospect I am hoping he gets a legit shot to make it work in Cleveland. Of course I have little to no faith in the organization. As a Cowboys fan I keep hearing they are cold on Bosa. As much love as Garrett had for wentz if he is there like your mock draft has, I can’t see them letting him get past them. I hope we get Ramsey or jack. I just think it is a scary proposition to take a team with a win-now window and start planning for far off in the future. I think the Cowboys should be among the favorites in the NFC, and adding a defensive stud will make a bigger impact in 2016/2017/2018 than either Wentz or Goff. Not a bad mock draft. Like that it’s not the same typical picks as everyone else out there is throwing around for teams. I do believe Cleveland takes a QB at 2 but that’s just my opinion. I think it would be Wentz and I think the 9ers get Goff if Dallas doesn’t take him. Heard the 9ers are trying to get an even better pick to assure Goff but who knows with all these rumors. Personally as a 9ers fan I’d like to see them grab a CB. Hargroves is not the way to go at 7. Our corners are young and will look better with a better pass rush. Ultimately Wentz to the Browns and Goff to the 49ers are the likely picks. For my money, I think if the Browns take one they should take Goff, but at this point don’t think that is the direction they will go. Not sure if this was before or after Brick news but if Jets take Hunter Henry over Jack Conklin or Taylor Decker I’m out. Won’t speak for Rob, but he did send this to me to edit/publish before the Brick news broke today, so it’s possible he’d have the Jets taking a tackle now. Luke is right. The Jets would be much better off with a tackle, especially after the Brick news. I don’t know the overall strength of the LT depth in this draft, but if the Jets feel they can get a quality LT in the second round, I don’t think its that crazy to see them take Henry. Again, I don’t know how deep this draft is in LTs, but I know that the TE depth is definetly lacking with Henry being far and away the best one. Definitely before the Brick news and Henry is a reach anyway. I think Conklin has stud potential at guard with tacle upside. The Jets would be lucky to have him, and should run to the podium to get him. I think Bell is stretch to fall that far, but one of those safeties is going to be there (Keanu Neal, Darian Thompson, Tyvis Powell, T.J. Green). I think Braxton Miller and Hunter Henry are likely second or third round talents, but was looking for players that teams have targeted specifically. Both would be unexpected first-round picks. Karl Joseph will be there, injuries make him a late 2nd – 3rd round pick. Analysts think Henry is a late-1st talent, but the only team in need of a TE that late are the Packers and the Broncos, both of which have more pressing needs and too many defensive players that they can’t pass on and I think the Jets can get him in the 2nd round. I’ve seen Braxton high in some mocks, but there’s nothing that separates him from the rest of the pack to vault him in to the 1st imo. Joseph is the best safety in this class talent wise and deserves to go in the first round based on the tape. Injuries could drop him. I actually wouldn’t give Henry or Miller first-round grades. I think Henry is tremendously overvalued and that the Jets should go in a different direction. They should hope Alexander or Conklin is there. Braxton I like but no way is he a value in the first round. His teammate Michael Thomas makes much more sense. Houston is high on Miller, but if they passed on him I don’t think any other team would consider him in round one. I personally prefer Mackensie Alexander over Hargreaves, but I don’t necessarily see a bust out of him. He is undersized, but he competes well. I would hope he has a long career as a high end number two corner. In the top 10 the plan would for him to be a top tier player, which is far from a guarantee. Oh and I will be surprised if Elliot goes in the first Rd. To many good backs and not as big of need as it used to be. No matter what you think about Elliot or running backs in general, he is in the realm of possibility for the Cowboys, Ravens, Eagles, Giants, Dolphins, Raiders, Jets, and Washington. Between teams trading back and him falling to teams that didn’t expect him, I’d be shocked if he made it out of round one, even with the devalued position and the depth in this year’s class. There might be other good values, but he is a rare NFL-ready complete back. So was Trent Richardson, but that comparison shouldn’t drop him out of round one entirely. Elliot won’t make it past the Dolphins. Reality. If he does get past the Dolphins I think the Raiders jump on him. I doubt you will reply, but how is Sheldon Rankins no where to be found on here? He is projected on pretty much every mock draft I have seen as a top 15 pick and in many, a top ten. The glut of talent at defensive tackle hurts the entire group. Jarran Reed, A’Shawn Robinson, and Andrew Billings are all in the same boat as first-round talents. Sheldon Day is close too. Rankins probably has the chance to go highest, and the Saints will really consider him, but the Lions and Jets may prefer Robinson and I think the Packers would prefer Reed. All of those players have a chance to fall if the board breaks badly. I would rank all fpur ahead of Butler who goes to Carolina in this mock, but Carolina has looked closely at Butler. The idea that some of these guys will be available in round two devalues them all a little. That being said I expect more defensive tackles to end up in round one. Only question is which ones and where. Ha!… If Kevin Dodd is there at 30 the Panthers aren’t passing on him for Vernon Butler. The draft is deep at DT and not so much for Pass Rushers. Dodd is definitely an option, but the Panthers have been so strict with their best-player-available approach that I don’t know how positional value influences their thinking. They have showed more interest in Butler than any other team, and while it could be for show I think they won’t draft for need. You are right about the lack of pass rushers, if they don’t get one here the options become uninspiring at the end of round two. It wouldn’t be the end of Cutler, but the offensive coordinator behind his big 2015 is gone and John Fox didn’t fully support him like a franchise quarterback early last year. He isn’t going to get cut, but the organization has to look to the future. Fox is a defensive guy and Wilkerson is tremendously talented. I think it would be a steal if they could swap firsts for him, even if the Bears had to throw in later picks. Jared Goff is a superior prospect to Wentz and to me it’s clear. Goff I feel is a little undervalued even and Cleveland should be all over him at two (though for poor Goff’s sake I hope he doesn’t fall victim to the pit that is the Cleveland Browns). His absolute floor should be SF at 7. I suspect there are teams that are throwing smoke screens in an attempt to get Goff to fall but in the end, I believe he goes higher than Wentz. If not, I still think he has a better career and is more pro ready right now. No slight to Wentz. Just like Goff more. Don’t be surprised if someone trades up and takes Goff in the top 5. I wouldn’t be surprised. I’ve watched a lot of both players and at this point it is crystal clear that Goff is better and should go higher. Yet some teams still just value Wentz more. I keep saying by the time April 28th comes Goff will be QB1, but the Wentz hype hasn’t died down. I seriously don’t think there are 2 or 3 going to be correct picks in the entire thing. What a colossal waste of time to read.